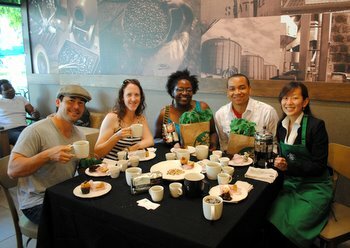 This week I had the opportunity to take part in a great Starbucks tasting event, tasting some of the Starbucks Reserve coffees with a Coffee Master, Yuli. 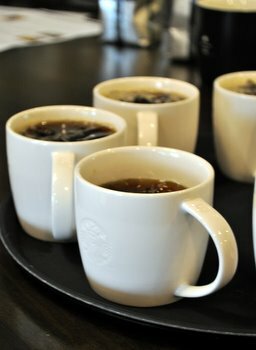 Starbucks Reserve Coffees are rare, small batch coffees that are being released in very limited quantities at various Starbucks stores across the country. They have coffees like Jamaica Blue Mountain, Organic Blue Java and 100% Kona Coffee. They’re coffees that come from small growers (in some cases, from single farms) and they’re items that will appeal to serious coffee drinkers (like me!). Of course, limited quantities also mean that once they’re gone, they’re gone for good – or, with any luck, until the end of the next growing season. Our tasting was of Sumatra Tapanuli and Kenya Tana River. 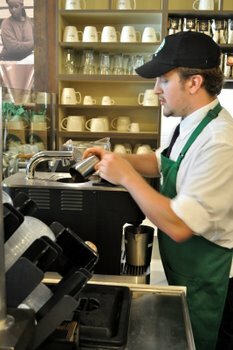 This was also my first time experiencing the Clover coffee brewing system first hand. It’s a very unique brewer designed to produce the perfect cup of coffee. Very few coffee shops have these, and only a handful of Starbucks locations. The way they brew, they are supposed to give you the most flavorful cup of coffee possible. We tasted coffee both hot and iced. I’ve never tasted coffee iced before, as coffee poured over ice tends to be a bit watered down and can even have an unpleasant bitterness to it. The Clover will brew coffee especially strong so that pouring it over ice will mellow it to the perfect consistency – and I would definitely confirm that this is the case. The iced coffee was easily the best iced coffee I’ve had, and it was still at least as flavorful as the hot cups we tasted. I’ll post separate reviews of both the Kenya and the Sumatra coffees, but I will say here that they were both excellent. African coffees often make good iced coffee and the Kenya was no exception. It was almost better iced than hot. 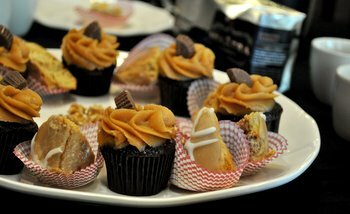 We paired the earthy Sumatra with mini chocolate peanut butter cupcakes and maple scones, where the sweetness balanced the rich coffee. Kenya got matched up with orange cranberry scones, where the citrus made the coffee seem even more fruity. I can never resist a good dessert coffee pairing and Yuli did a fantastic job picking out these combinations, as they matched the coffees perfectly. 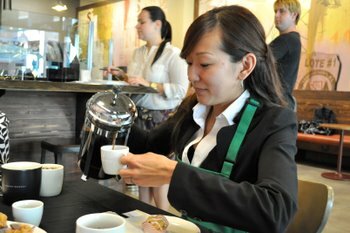 The coffee tasting was great, and the reps from Starbucks were incredibly informative and fun to spend time with. We were joined at the tasting with Amir and Chrystal from Duo Dishes. I volunteered to bring some of my own coffee pairing snacks to the next event – so now my hosts will have something to look forward to, just like I look forward to these tastings.